You have seen the pipes going through Wick and today one of the biggest towheads came through moving extremely slowly to safely manouvre round corners and tight bends. Tailbacks were inevitable as police held up traffic to allow the towhead to make progress. Once past Wick the convoy made its way on to Subsea7's yard at Wester. This week saw thirteen new officers enrolled into the ranks of the Special Constabulary within Police Scotland Highland and Islands Division, the first sworn in since the creation of the new police service since April 2013. The Special Constabulary is a unique body of people who voluntarily give up their personal time to contribute positively to the wellbeing and safety of their communities. Working alongside their regular colleagues, Special Constables undertake a diverse range of Police duties and they frequently face many of the challenges and attain many of the achievements of their full time colleagues. The new Special Constables, 11 based on the mainland, one in Orkney and one in the Western Isles, were sworn in as part of a series of oath ceremonies conducted across the Highlands and Islands. The Highland Council has appointed a consultancy firm to assist with the preparation of the new 2014-2020 Highland LEADER Development Strategy. LEADER is a European grant fund aimed at rural community development projects. The 2007-13 LEADER programme saw some £14.7 million of grant funding awarded to over 360 community projects in Highland. As part of the preparation for the next funding round, a series of public meetings across Highland are planned between 16th- 27th June this year. Enjoy a nice evening going to see the puffins and hear about Caithness birds before you set off. Home baking wil set you up for stroll to the cliffs. Book your place soon. Scottish Independence - Aye or Nae? Last week 120 students and staff at North Highland College UHI attended an in-house Independence Referendum debate "Aye or Nae". The event was organised by members within the college to better inform students and staff for their vote in September. In preparation for the debate the College encouraged students to go along to pre-debate workshops where they would work on questions for the debate. Mr Raymond Bremner represented Yes Scotland and Councillor Roger Saxon represented Better Together. Both Yes Scotland and Better Together were approached by the College at the same time to request speakers. CAITHNESS Heart Support Group is in fine fettle and looking forward with confidence to the challenges it faces in the new financial year. That was the upbeat message that went out from its AGM, held, recently, in the canteen at Caithness General Hospital. The group splits its efforts between raising money for medical equipment and acting as a social forum for people with heart conditions. The annual meeting, chaired by the group's patron, Miss Anne Dunnet, Lord Lieutenant of Caithness, heard from chairman, Ernie Ross, that the year had been another successful and productive one. Dogs Trust, the UK's largest dog welfare charity with two rehoming centres in Scotland, has teamed up with The Highland Council to provide free microchipping for all dogs in the Highlands. From 6th June -10th June, roving teams of Dogs Trust representatives will be spending a week touring the Highlands, providing free chips to local dog owners at five different locations. At each event, Dogs Trust representatives will also be on hand to answer any general queries from dog owners whilst reminding them of the importance of keeping the contact details on their dog's microchipping database up-to-date. Microchipping is a simple and effective tool which helps to rapidly reunite lost or straying pets with their owners. This in turn reduces the number of healthy dogs unnecessarily put to sleep and saves money for Local Authorities by cutting kennelling costs. The Access to Construction and Engineering (ACE) students from the North Highland College UHI have gone above and beyond their call of duty this academic year. The students have raised £973 for charity, contributed enterprise projects to a local festival and donated some of their work to a local community group. The ACE course gives students the chance to develop their core employability enterprise and citizenship skills. As part of their enterprise unit, one group of students became involved with Caithness Horizons' Year of the Ancient Ancestors Festival by developing Viking inspired products for the museum. Anyone with an interest in marine energy might wish to take look in on this lecture being held at ERI, Thurso. With marine energy being touted often as one of the means that Caithness will gain some new employment and contracts as Dounreay runs down this lecture may give some serious insights into what the fact are. Doors open at 1715 - all ERI Seminars are free and open to all. Light refreshments will be available. Ian will present a personal account of his research, which has been primarily related to marine renewable energy. This will include his early work with the University of Edinburgh Wave Energy group in the 1980s and describe how work by his colleagues still underpins wave and tidal current development now. He will discuss how marine energy research has developed since the 1980s and how he sees the future of marine energy and the supporting research, which will include hydrodynamics, marine science, economics, engineering and ecology. Today the church of England has once again set out the case for supporting a local credit union in their war against Pay Day Lenders. In February they announced that they would their churches al over the country to promote the credit union network as being one of the best ways the local communities could help each other for low levels of finance without hitting people with high charges. There were 65,307votes cast in Highland in the five-yearly European Parliamentary Elections, a turnout of 36.3%. This included 20,204 postal votes. The annual junior football tournament organised by Castletown Junior football club got underway on Saturday. The competitions continued in the various age groups today. Natural Retreats is looking for seasonal and permanent staff for what is expected to be a busy season at John O'Groats. Interested? Then send your CV to the email address inside. A significant number of posts have now been made on our forum and the number grows even after we delete all the items for sale regularly. If we did not do that then the number would be over one million by now. The forum is great place to find things you need and to advertise your unwanted goods, cars for sale andmany other items. Check it out - still FREE. Job ads are free for employers and growing numbers are using the forum closing date or after 3 weeks if it looks likley to be no longer required or you can ask to have the ad deleted anytime. A short round-up of business news in the north from the past week. The Queens Hotel got their Wick & District Summer Pool League title defense off to a great start on Monday night thanks to an 8-2 away win against the Mountain Dew. Perry Campbell's side raced into a 6-0 lead to secure all three points in their opening match of the 2014 season. Campbell and Scott Risbridger won all three of their games for the Queens Hotel on their way to a comfortable victory. A great chance to get surfing for youngsters in Caithness. A national multi-agency doorstep crime operation, led by Police Scotland, has been a major success in preventing and beating the rogue traders and doorstep con men. Police and other agencies detected over 1,000 offences during the dates of operational activity, with over 200 individuals being subsequently arrested. Charges specific to activity surrounding serious and organised crime were also libelled and reported to the Procurator Fiscal. Operations Monarda 1& 2, which ran in conjunction with the UK wide Operation Rogue Trader, achieved the results during operations in April 2014 and September 2013. The adult paper making two day course has been completely filled in a very short time. However you can still go to the drop in sessions arranged for 14th June and find out how its done. 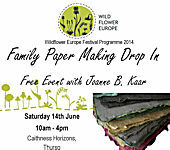 Joanne Kaar has built a considerable reputation making hand made paper. She shares her expertise and knowledge of the process and once again will be available for a day of drop in sessions. If you want to find out about how it works then all you need is 20 - 30 minutes and you can make your own paper. Make a note in your diary or calendar for Saturday 14th June. NORTH SEA oil and gas services company Subsea 7 has been awarded a £270m contract to build a 37 mile pipeline and associated facilities, the BBC reports today. The parents and children who attend Wick Library’s regular Bookbug session on Wednesdays at 11:00am recently celebrated Bookbug Week with Library Assistants Alison Bain and Emma Curran. The Bookbug Programme encourages parents and carers to enjoy books with children from as early an age as possible. Scottish Book Trust in partnership with Highland Libraries and other partner organisations gift free books to Highland children at around sixteen weeks, 18 months and three years old. National Theatre of Scotland is delighted to announce that 180 The Great Yes, No, Don’t Know, Five Minute Theatre Show pieces have been selected to take part in the exciting 24 hour online broadcast of live theatre, taking place on Monday 23rd June, from 5pm until 5pm the following day, with over 10 performances coming from the Highlands. Head for Castlehill Heritage on 22nd and 23rd May at 7.30pm for talks and observing sessions. See the poster for more of what you might expect on the night. On Thursday (22 May 2014) polling stations across the Highlands will be open from 7am to 10 pm for people to cast their vote in the European Elections. Already more than 18,000 people have returned postal votes. Those still to post their vote must do so tomorrow (Wednesday), or deliver their envelope to any one of the 265 polling stations on Thursday. Budapest Café Orchestra are BACK at Melvich Monday June 2nd 7.30pm . Tickets are likely to be snmapped up so book early. Check them out in short clip from last years show. Over 90 motor cycles lined up for the rally that toured the county starting at Lybster and heading to Wick and John'Groats. The rally raised money for charities. Prize giving took place back at Lybster at the end of the rally. A date has been set for a budget event being held in Caithness by The Highland Council to consult with the public over spending priorities between 2015 - 2019 during which time the Council has to find savings of an estimated £63 million. The forum is being held on Tuesday 27 May at 6:30pm in Wick Assembly Rooms. It is one of a series of 13 events being held throughout the Highlands by the Council. The forum will also include the first stage of public consultation on the Customer Service Review (including Service Points) agreed at the Council meeting in March. Feedback from the public and focus groups will help shape the Council’s budget setting priorities. The 37,300 tonne, 200 metre (655 feet) long cruise liner Saga Sapphire has become the largest passenger ship at least in decades, if not ever, to navigate the Pentland Firth's Inner Sound. That was when the British-owned, but Malta-registered, ship sailed through the 1.5 mile-wide sea-channel, between Caithness's North Coast and Stroma, the county's only island, on the morning of May 15th, 2014, during a 'round Britain' cruise. The mighty vessel was carrying 589 holidaying passengers, largely of 'over 50s' that Saga Cruises specialises in catering for, and had a crew of 419 on board. Experienced local rally driver who has been involvedi n many competition over the years is looking for co-driver. Bill's usual partner is unable to compete in coming competitions. Bill said," I am looking for a Navigator for the STRC championship to compete in the following Crail 14th June, Machrahnish 5th July, Solway 9th Aug, Pendragon 21st Sept and Kingdom 1 Nov."
No excuse for scruffy hair these days as a new barber shop has opened in High Street, Wick. In recent times the hsop has been occupied by a dress designer and before that a property shop. The opening hours are well suited to the busy person with several nights with later closing times including Saturdays. Other recent moves to the centre of town include Divas and Dudes and convenience shop Keystore just on the corner of Bridge street and High street. Everyone is aware that roads in the UK are deteriorating due to lack of spending on them. This affects all drivers as damage to vehicles from potholes is known to be huge and although claims can be made against the local authority or the trunk roads authority this does help with all the inconvenience whilst cars, vans or trucks are off the road for repairs. Reporting potholes by the general public does at least mean that a particular problem gets on to the list of potholes to be repaired and often short-term repair is carried out very quickly after a report is lodged and that at least helps all motorists. There is pelnty of activity building up in the energy sector in Caithness and the far north generally. While it may have seemed for long time that for all the announcments over the past few years not much actually was to be seen. Well that is now changing. Click through to watch a short vide from SSE about their transmission project starting from Caithness and really begining move now. The seemingly never ending stream of pipes heading through Wick to the yard at Wester shows just how busy they are. Earlier this year, Caithness artists Joanne B Kaar and Liz O’Donnell started a fundraiser for Brough Bay Association and Castletown Heritage Society, inviting the public to get arty and made postcard size artwork inspired by the sea. With the deadline for handing in artwork in a few weeks time (20th June 2014), things are starting to hot up around the world with artists adding the finishing touches to their creations. The sea inspired fundraiser featured in the May issue of Coast magazine as their campaign of the month, and as a result the word spread with more artists getting involved including a ceramicist from the south of England and tapestry artist from Dumfries and Galloway both currently making work for the fundraiser. There has been a wonderful variety of materials used by artists, including 3D wooden sea creatures (which move around) from Taiwan, and more locally, glass you can ‘sea’ through is being formed! Dates have been set for a series of 13 budget events being held by The Highland Council to consult with the public over spending priorities between 2015-2019 during which time the Council has to find savings of an estimated £63 million. The sound of bumblebees buzzing around our flowers on a warm sunny day is a sure sign summer is here. But bumblebees are also an essential part of the countryside, responsible as they are for pollinating our crops and wildflowers. However, in the past 80 years, two of the 26 species in the UK have become extinct and several others are now extremely rare. Of these, one species – the Great yellow bumblebee – can only be found in parts of Caithness and Sutherland, and the islands of Orkney, Coll, Tiree and the Outer Hebrides. Now the Bumblebee Conservation Trust (BBCT), which was set up to address this decline, is calling on people in Scotland to help boost populations of this rare bumblebee. On Monday, 19th May 2014, the trust will unveil plans for an exciting new project which could see Thurso styled as the UK’s first 'Great Yellow Bumblebee town' – a project called Gateway to the Great Yellow. Four positions in the Thurso Area - various days and hours available. The Highland Council’s Trading Standards team are warning householders that they are aware of a number of doorstep traders currently operating in the area and carrying out exterior home maintenance work. Suggestion - Never buy if approached at the door, phone, fax or email unless you already know the people or check them out from friends and relatives. Do not sign anything until it's checked and never hand over cash. Knock Knock, Ding Dong - Think, Put Brain In Gear, Say No - You can always make checks and buy later. FARLEY MOWAT, Canadian best-selling author, 'pioneer' ecologist and life-long left-wing campaigner who was proud of his Caithness ancestry, b. 12th May 1921 in Belleville, Ontario, Canada died 5th May 2014 in Port Hope, Ontario, Canada. Farley Mowat was, one of Canada's best-known authors, who sold an estimated 17 million books worldwide with several of his 40 titles translated into over 20 languages, died on May 5th at his home in Port Hope, near Toronto, just 5 days short of his 93rd birthday. One of his books, Never Cry Wolf became a successful Hollywood feature film, while several others spawned 'made for TV' movies. Caithness medieval crafts, a journey through Sutherland’s Mackay country, the great Lochaber outdoors, Skye family history, Highland music and games in Strathpeffer, and an intrepid Nairn explorer are all on the agenda this weekend thanks to the “My heart’s in the Highlands” Homecoming 2014 project. Venues in Caithness, Sutherland, Lochaber, Skye, Ross-shire and Nairn will all be hosting events this weekend encouraging local people and visitors to explore and celebrate what makes the Highland special to them. Caithness Horizons in Thurso will be holding a free children’s medieval manuscripts craft workshop with artist Joanne B Kaar on Sunday (18th May), 1.30pm-3.30pm. Children will be able to learn about the links between medieval manuscripts and the Skinnet Stone and then create their own 3D version of a letter from an illuminated manuscript which will be displayed at the Museum. Confused.com is launching its first ever interactive 'Talking BRIAN' app. Say whatever you like to BRIAN, and he will mimic you. This new free app is now available to download in Google Play and Apple's App Store, meaning you can speak to BRIAN whenever you want. Do you enjoy a good thriller? Are you a fan of those Nordic Noir Books, such as The Girl with the Dragon Tattoo, or TV Series such as the Killing? Do you like good comedy? Do you enjoy a good night out? Do you enjoy a night at the Theatre? If you have answered yes to one, several, or all of the above, please come and see Inspector Norse at the Mill Theatre Thurso on Wednesday 14th May. Two years into its major contract to complete the clean-up and shutdown of Dounreay, the consortium in charge of Dounreay Site Restoration Ltd is now revising its programme of work to accommodate changes being made by the Nuclear Decommissioning Authority. The NDA awarded a contract in April 2012 to Cavendish Dounreay Partnership. At the time the NDA was seeking comments on the credible options for the future of nuclear materials at Dounreay. Do you fancy a trip to the second largest island of Orkney, sailing to Hoy on the Pentland Venture passenger ferry from John O’Groats. We will then be taking the bus across Hoy from Lyness Harbour to Rackwick Bay where you can join the Countryside Ranger walking out to the famous “Old Man” sea stack or independently explore Rackwick Bay. Employers can use the jobs sections completely free of charge to save you time and money. Just jointhe forum and post as many jobs as often as required. Mark Macadie, a P6 pupil in Mrs Ferrier’s class at Pulteneytown Academy in Wick, was the overall winner in the very first Young Ranger Trophy competition in memory of former Caithness Countryside Ranger Dieter Tuerlinckx. Mark’s fairy story about Whiteheart Forest and its new fox king was chosen as first place entry in this new annual school competition. Second place went to Emma Sutherland from Halkirk Primary School and third place to Jay Barrett from Keiss Primary School. Mark was awarded the Young Ranger Trophy and a certificate from The Highland Council Countryside Rangers Kirsty Rosie and Paul Castle. Members of the Caithness Countryside Volunteers, with direction from John Parrott from Coille Alba, undertook control measures on Giant Hogweed along the Wick riverside last weekend. Growing to 20 feet high, this impressive plant was once planted in gardens but has become a problematic invasive species in Britain, particularly along river banks. The plant is detrimental to other native species but is also a concern to people as it contains toxic chemicals which can cause blistering and burns. Scottish Natural Heritage employed John Parrott to undertaken spraying of the plant last year and with help of the Caithness Countryside Volunteers has been monitoring and controlling new growth. An exhibition of work by the internationally acclaimed, Turner-Prize winning artist Douglas Gordon takes place at Caithness Horizons in Thurso. The works on show – which include three video installations and one text piece – have been presented by Douglas Gordon to the ARTIST ROOMS collection, and are being shown for the first time since their acquisition. This exhibition also forms part of GENERATION, a national programme taking place in the summer of 2014, which celebrates the wealth of contemporary art that has developed in Scotland over the last 25 years. Over 60 venues across the country are participating in this unique programme. Among the works on show in Caithness is Gordon’s elegant, iconic 1996 video installation A Divided Self I and II, in which two arms, apparently belonging to two people, one hairy and the other smooth, are seen wrestling with one another. In fact the arms belong to the same person - the artist - who evokes by the simplest means a powerful internal struggle, in which the hairy arm appears to represent evil and the smooth arm good. Dunbeath Heritage Centre is calling on the people of Caithness to come forward with World War I or II related photographs, medals, letters or stories, to help shape a new exhibition within the centre. The call out for artefacts is part of the Centre’s involvement with the Festival of Museum. Created and co-ordinated by Museums Galleries Scotland, the Festival sees over 90 events, workshops, exhibitions and performances take place in museums across Scotland, including Caithness, across one weekend in May from 16th-18th. The by-election for a councillor to serve the Caol and Mallaig ward on The Highland Council has been won by Ben Thompson, Independent. Mr Thomson was one of five candidates, who contested the vacancy, created by the retiral of Eddie Hunter in February. He joins Councillors Bill Clark (SNP) and Allan Henderson (Independent) in representing Ward 12. Voting was by the single transferable vote and Mr Thompson emerged as the winner at the fourth stage of the count, gaining 932 of the 2,391valid first preference votes cast. The quota was 1,196. 23 votes were rejected.......The representation of the 80-member Council now is: - Independent 34, SNP 21, Liberal Democrats 14, Labour 8, Independent Nationalist 1, Non-aligned 2. The Administration is currently a combined SNP/Lab/Lib Dem coalition. A total 30,068 Highland residents have asked to vote by post at the forthcoming European Parliamentary elections. Postal votes are being sent out today 1 May and a second issue will be dispatched on 12 May. The deadline for new postal vote and postal proxy applications, and changes to existing arrangements is 5pm on Wednesday 7 May. The summer programme for Cauthness Field Club is now available. The Field Club are always happy to see members and non-members on any of their outings around the county. If you want to find out more about Caithness then this group will add to your knowledge whilst getting out around many interesting places that you might not have thought of visiting before. Partners in consumer education and crime prevention are jointly spearheading a national Scam Awareness Campaign which will run throughout May 2014. The Highland Consumer Partnership (Highland Council Trading Standards, Citizens Advice Scotland and Highland Citizens Advice Bureaux) have prepared joint activities and scam prevention information for consumers across the Highlands and Islands.